SBCTA and Omnitrans render of the Diesel Multiple Units. The train will operate in 2021 on the new Arrow Service between San Bernardino Transit Center and Redlands University. SBCTA’s render of New York Street Station showing the DMU and station design. 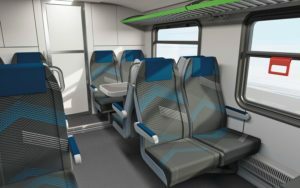 This is the final rendering of the interior of the arrow service DMUs. This is an overview photo of the Arrow Service showing the 9-mile long rail between San Bernardino Transit Center and Redlands University station. San Bernardino County’s public transportation is growing. Furthermore, San Bernardino County Transit Authority (SBCTA) is extending rail service east towards Redlands. A new rail project on the horizon is called Redlands Passenger Rail Project. Redlands Passenger Rail Project is a new 9-mile rail service connecting University of Redlands to San Bernardino Transit Center using the old Union Pacific Freight Line. The new rail service is designed to include five new stations connecting Redlands to Metrolink, Mountain Transit, Omnitrans, Pass Transit, Riverside Transit Agency and Victor Valley Transit. The five stations planned are San Berardino Transit Center, Tippecanoe Ave. Station, New York St. Station, Downtown Redlands Station and the University of Redlands Station. The new rail service, “Arrow Service,” is operated by Omnitrans. Redlands Passenger Rail Project will begin construction on the mainline in early 2019 and service will operate in mid-2021. The rail service will serve up to 25 round trips between San Bernardino Transit Center and the University of Redlands. With the population growing, vehicle transportation will increase in surrounding areas and freeways. This creates congestion within roads and highways which decreases air quality in the surrounding regions. SBCTA is developing the Arrow Service to provide more options for residents to travel around San Bernardino. The project was influenced by California multimodal of transportation to have different transit travel systems: pedestrians, bikes, cars, transit buses, rail, ferries, and air. This will provide jobs during and after construction as well as create potential business opportunities to grow along with the rail project. The locomotive units SBCTA and Omnitrans intend to use Diesel Multiple Units (DMUs). DMUs run on cleaner energy, produce less air pollution, less noise and are smaller compared to standard locomotive hauled coaches such as Metrolink. It would be costly for Metrolink to extend its service from San Bernardino Transit Center towards Redlands; as a result, SBCTA conducted research for more efficient trains. In the future, DMUs can change out their diesel engine to a zero-emission energy source. 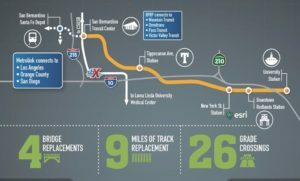 “One of the most exciting things coming out of the Redlands Passenger Rail Project is a state grant for $30 million dollars that SBCTA received to buy an additional vehicle core DMU, conduct research and development to transition that vehicle from being a diesel power generated vehicle to zero/near zero emission train. We will be progressing that work simultaneously while the construction of Redlands Rail Project is going on,” said SBCTA Director of Transit and Rail Carrie Schindler. The SBCTA will have Positive Train Control (PTC) on the Arrow Service. PTC is a computer-monitoring system which monitors the train speeds and distance between trains and signals, which adds more safety throughout the system. The Arrow Service will be running on the same tracks as Metrolink. They are required to install PTC on their rails and trains. Arrow Service will have quiet zones around the railroad crossings. This means the train will not sound off its horn at every crossing unless it is an emergency. “We have designed the corridor to include quiet zones so each of the cities that are along the alignment will adopt a quiet zone ordinance. What the quiet zone refers to the train typically have to sound its horn at every crossing so this requirement will be alleviated on the Arrow Service. The trains will not sound off its horn at every crossing because there will be improvements safety enhancements along all rail crossing,” said SBCTA Chief of Transit & Rail Programs Andres Ramirez. The project is estimated to cost $290.5 million of which includes different components from construction, designs, environment, DMUs and acquiring properties. The operation and maintenance cost after the system is fully constructed would be between $8 million to $10 Million. Redlands Passenger Rail Project is another public transportation service that will be added to the San Bernardino county’s mass transit system. This new service will extend rail service east traveling from San Bernardino Transit Center to the University of Redlands, serving more communities. 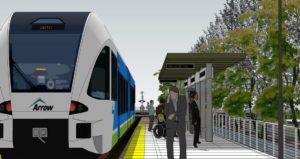 Redland Passenger Rail Project is a progressive regional transportation project that will add more options for residents, tourists and businesses to travel around San Bernardino and its surrounding cities.